Role of anticholinergic therapy in COPD Adil Al Sulami Medical Resident KAUH. 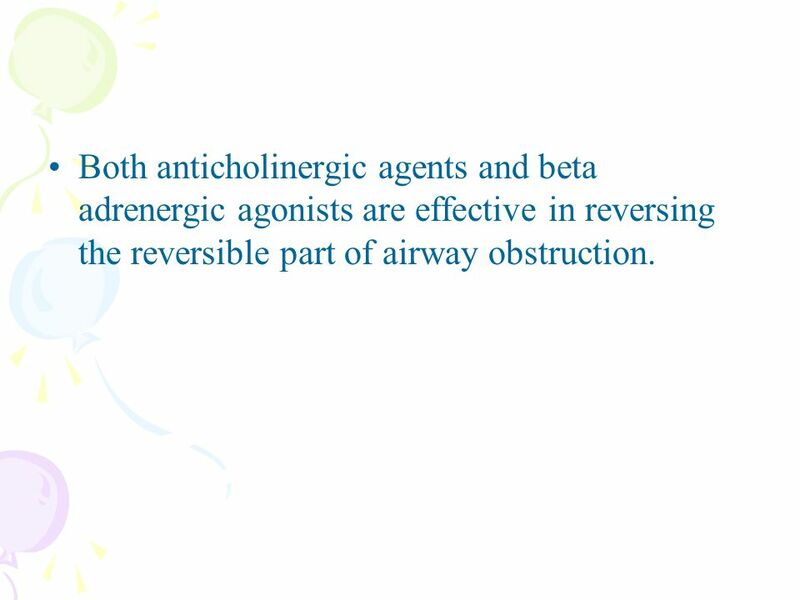 2 Both anticholinergic agents and beta adrenergic agonists are effective in reversing the reversible part of airway obstruction. 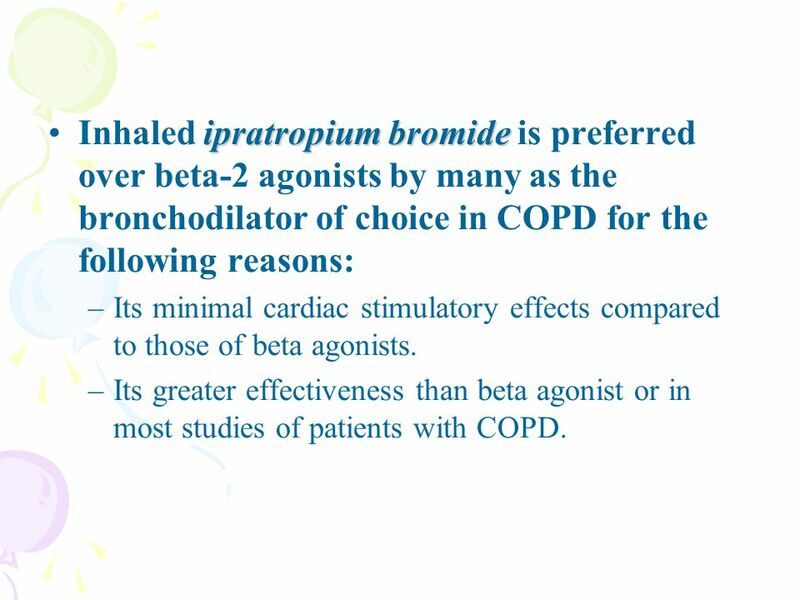 3 ipratropium bromideInhaled ipratropium bromide is preferred over beta-2 agonists by many as the bronchodilator of choice in COPD for the following reasons: –Its minimal cardiac stimulatory effects compared to those of beta agonists. –Its greater effectiveness than beta agonist or in most studies of patients with COPD. 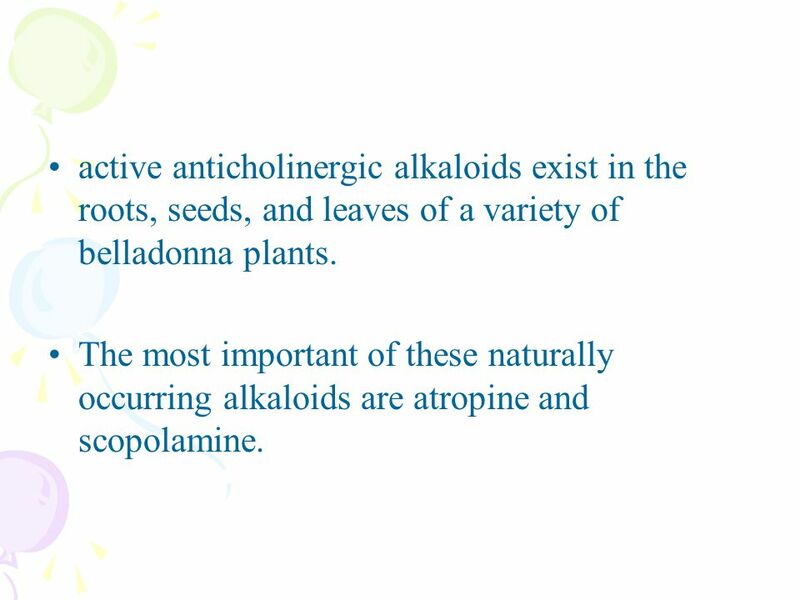 4 active anticholinergic alkaloids exist in the roots, seeds, and leaves of a variety of belladonna plants. 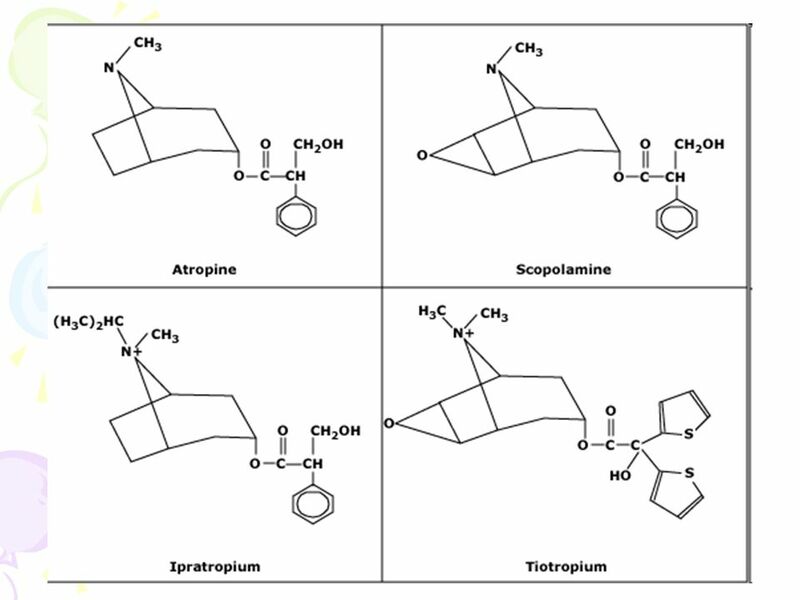 The most important of these naturally occurring alkaloids are atropine and scopolamine. 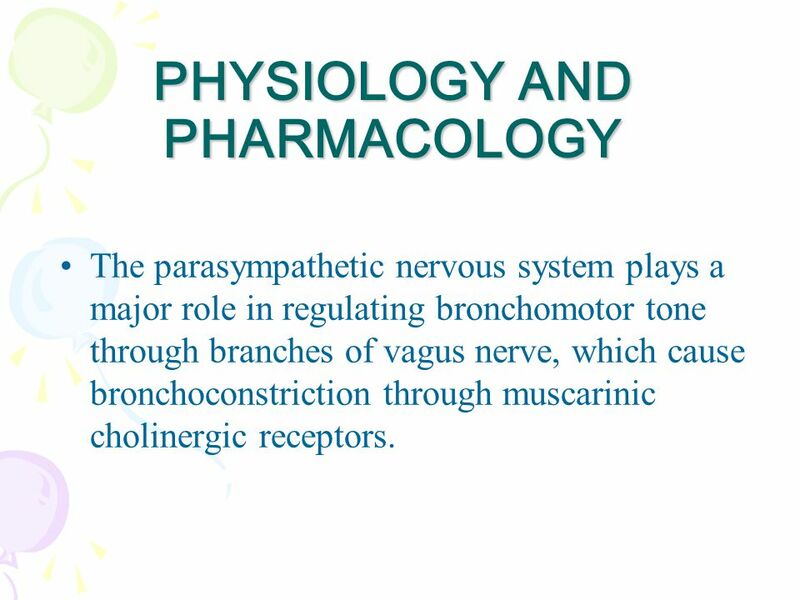 5 PHYSIOLOGY AND PHARMACOLOGY The parasympathetic nervous system plays a major role in regulating bronchomotor tone through branches of vagus nerve, which cause bronchoconstriction through muscarinic cholinergic receptors. 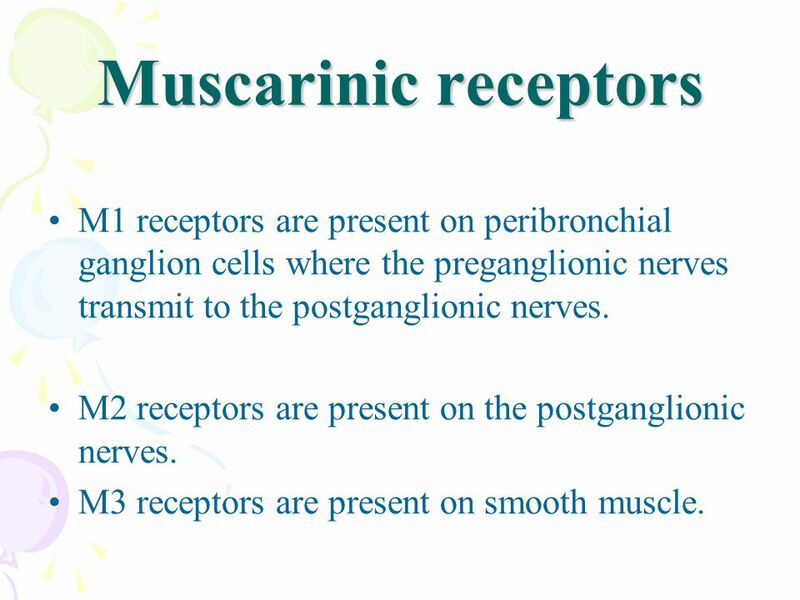 9 Muscarinic receptors M1 receptors are present on peribronchial ganglion cells where the preganglionic nerves transmit to the postganglionic nerves. 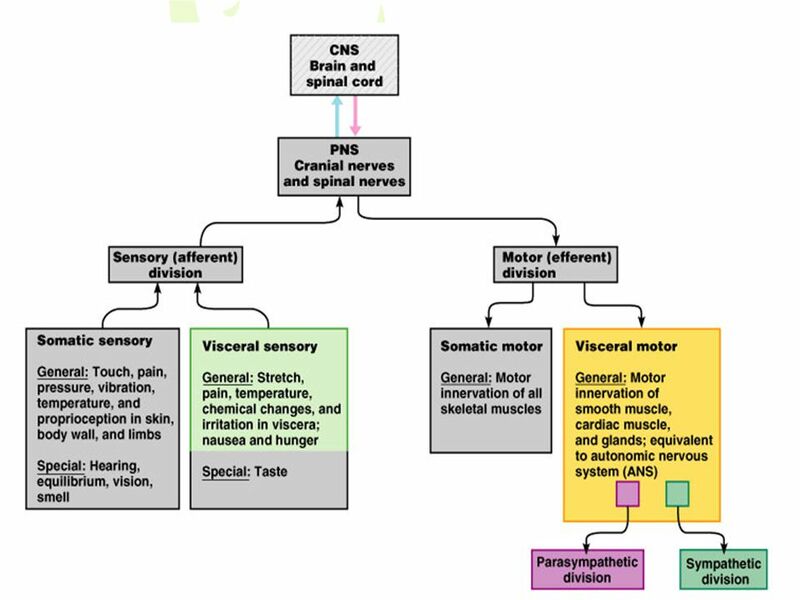 M2 receptors are present on the postganglionic nerves. M3 receptors are present on smooth muscle. 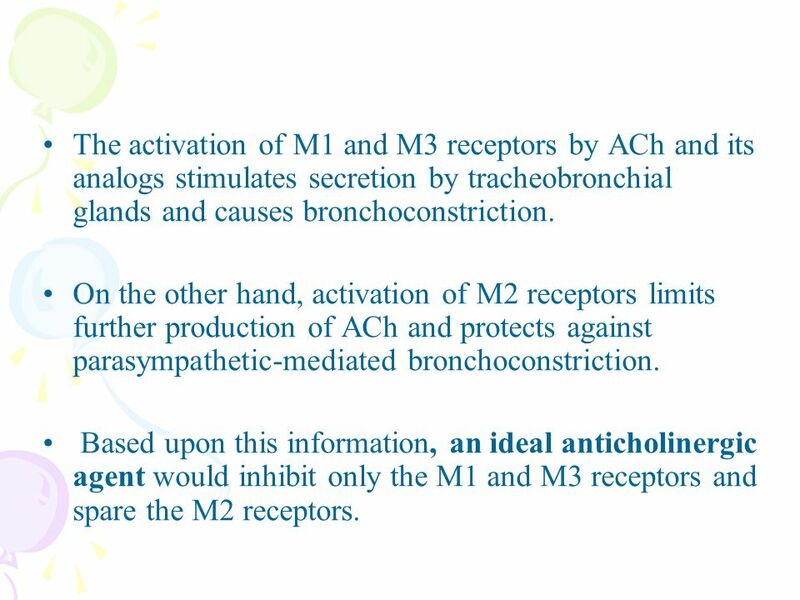 11 The activation of M1 and M3 receptors by ACh and its analogs stimulates secretion by tracheobronchial glands and causes bronchoconstriction. On the other hand, activation of M2 receptors limits further production of ACh and protects against parasympathetic-mediated bronchoconstriction. 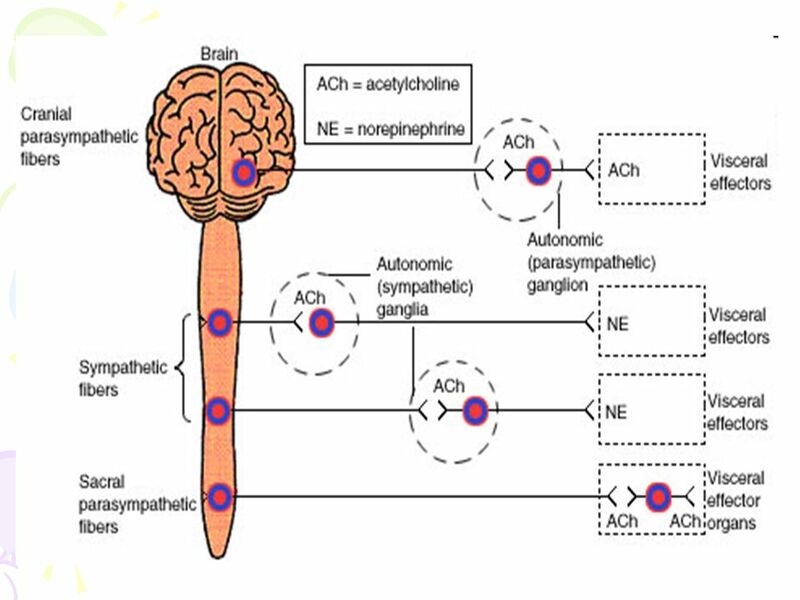 Based upon this information, an ideal anticholinergic agent would inhibit only the M1 and M3 receptors and spare the M2 receptors. 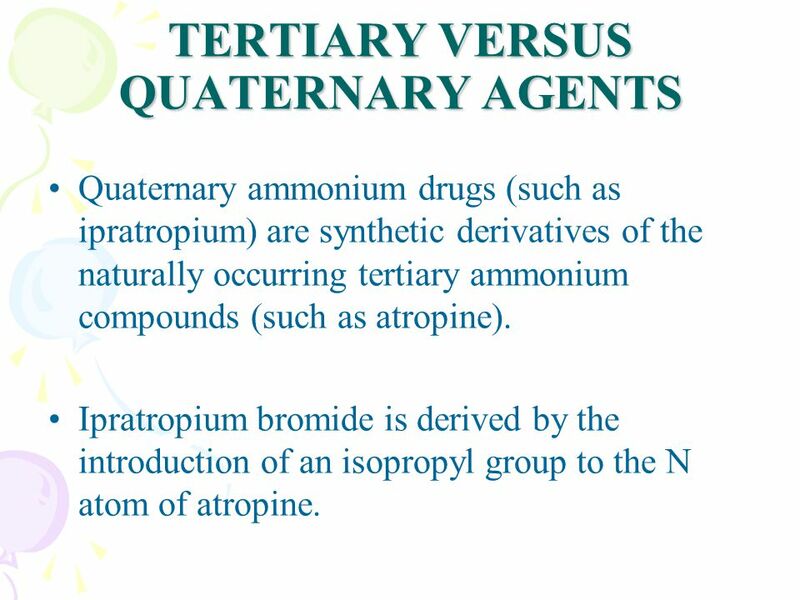 12 TERTIARY VERSUS QUATERNARY AGENTS Quaternary ammonium drugs (such as ipratropium) are synthetic derivatives of the naturally occurring tertiary ammonium compounds (such as atropine). Ipratropium bromide is derived by the introduction of an isopropyl group to the N atom of atropine. 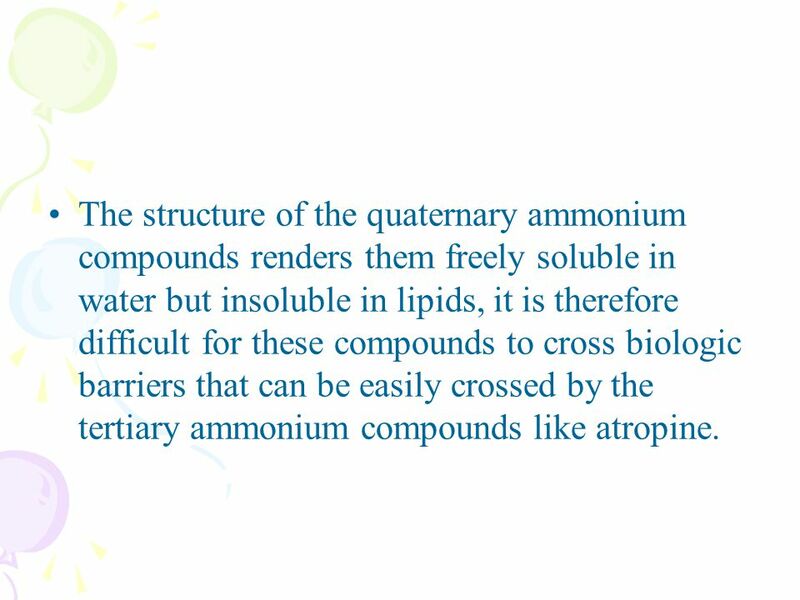 14 The structure of the quaternary ammonium compounds renders them freely soluble in water but insoluble in lipids, it is therefore difficult for these compounds to cross biologic barriers that can be easily crossed by the tertiary ammonium compounds like atropine. 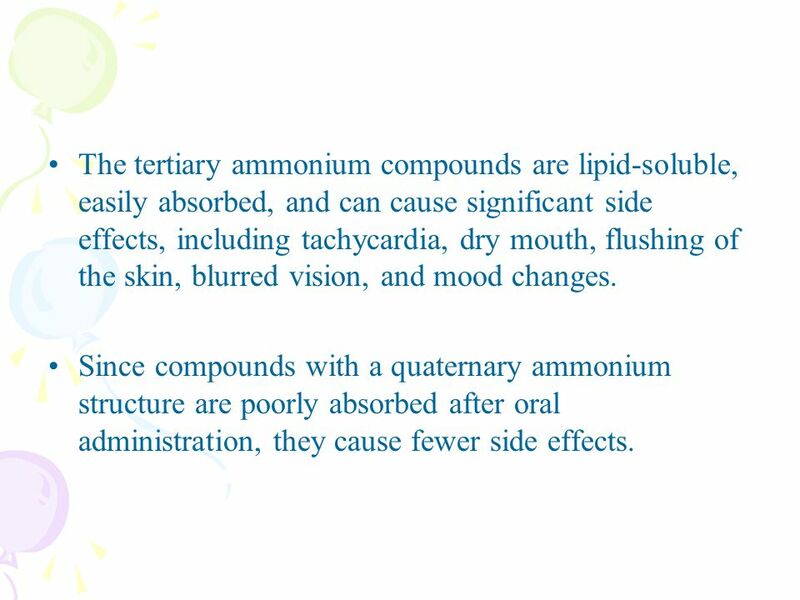 15 The tertiary ammonium compounds are lipid-soluble, easily absorbed, and can cause significant side effects, including tachycardia, dry mouth, flushing of the skin, blurred vision, and mood changes. Since compounds with a quaternary ammonium structure are poorly absorbed after oral administration, they cause fewer side effects. 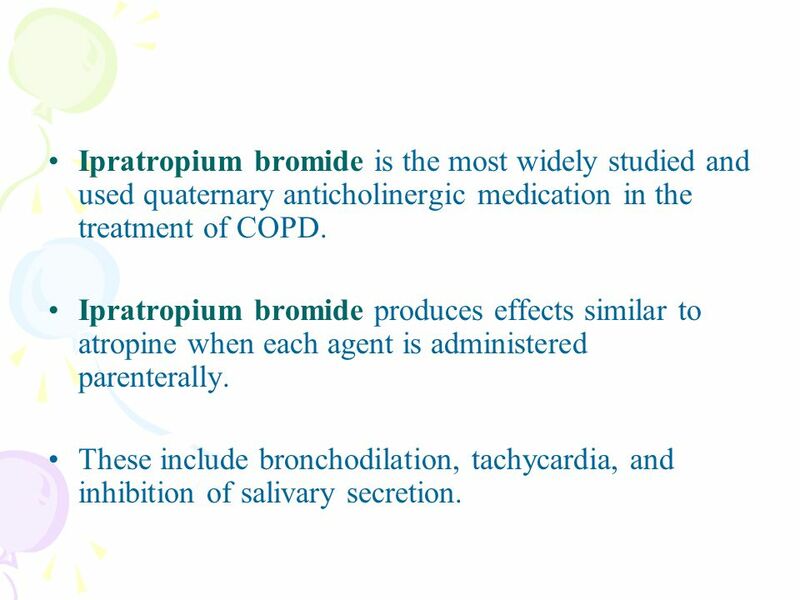 16 Ipratropium bromide is the most widely studied and used quaternary anticholinergic medication in the treatment of COPD. 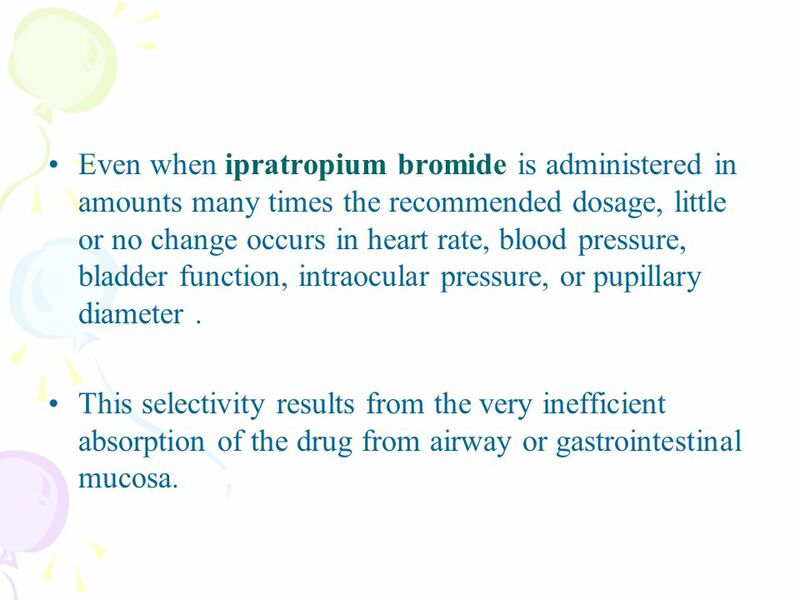 Ipratropium bromide produces effects similar to atropine when each agent is administered parenterally. These include bronchodilation, tachycardia, and inhibition of salivary secretion. 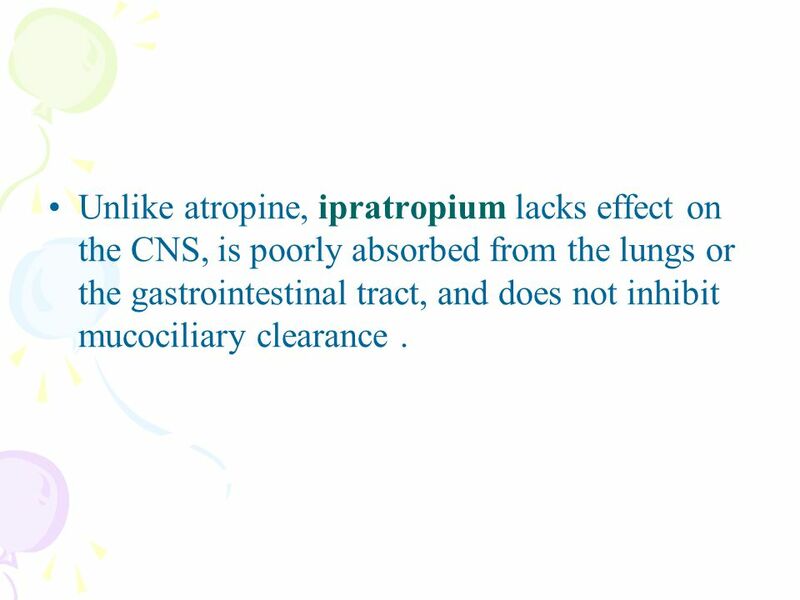 17 Unlike atropine, ipratropium lacks effect on the CNS, is poorly absorbed from the lungs or the gastrointestinal tract, and does not inhibit mucociliary clearance. 18 Even when ipratropium bromide is administered in amounts many times the recommended dosage, little or no change occurs in heart rate, blood pressure, bladder function, intraocular pressure, or pupillary diameter. This selectivity results from the very inefficient absorption of the drug from airway or gastrointestinal mucosa. 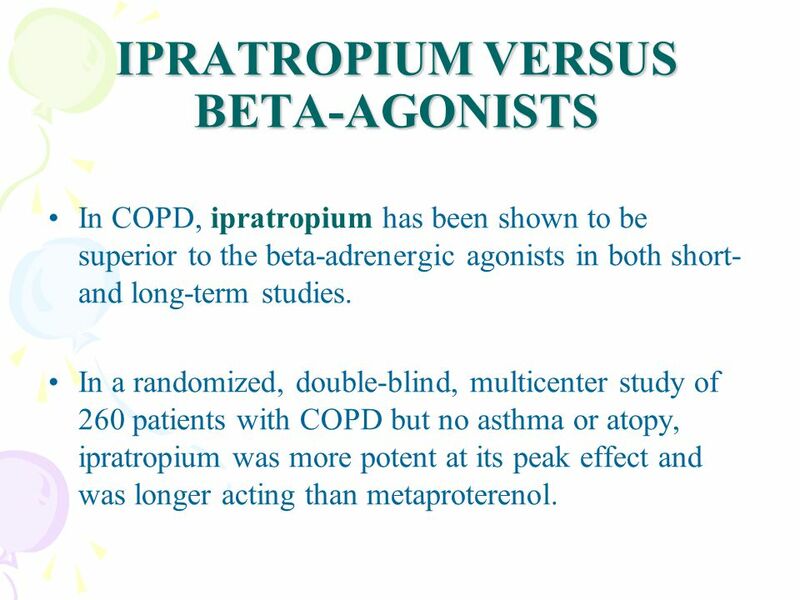 19 IPRATROPIUM VERSUS BETA-AGONISTS In COPD, ipratropium has been shown to be superior to the beta-adrenergic agonists in both short- and long-term studies. 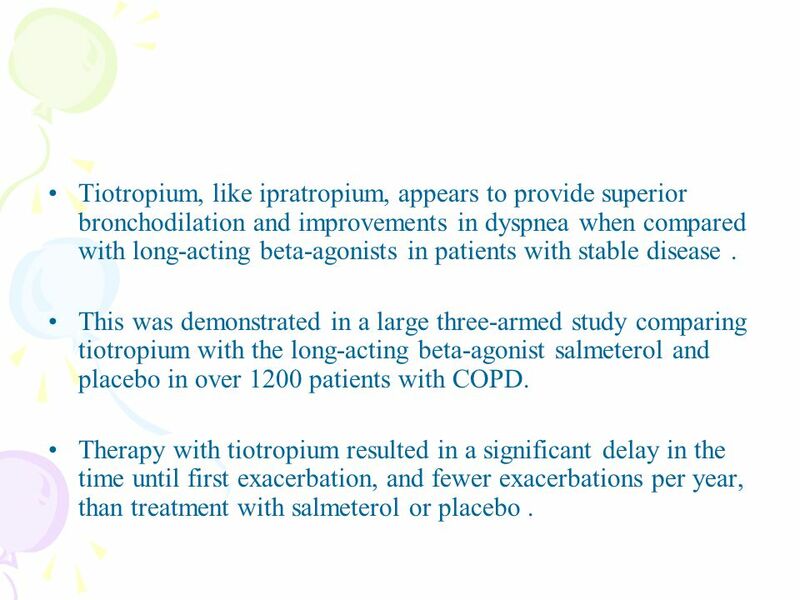 In a randomized, double-blind, multicenter study of 260 patients with COPD but no asthma or atopy, ipratropium was more potent at its peak effect and was longer acting than metaproterenol. 20 beta-2 agonist use in patients with COPD may be accompanied by pulmonary vasodilation, which may worsen ventilation-perfusion matching and result in a slight fall in arterial PaO2. 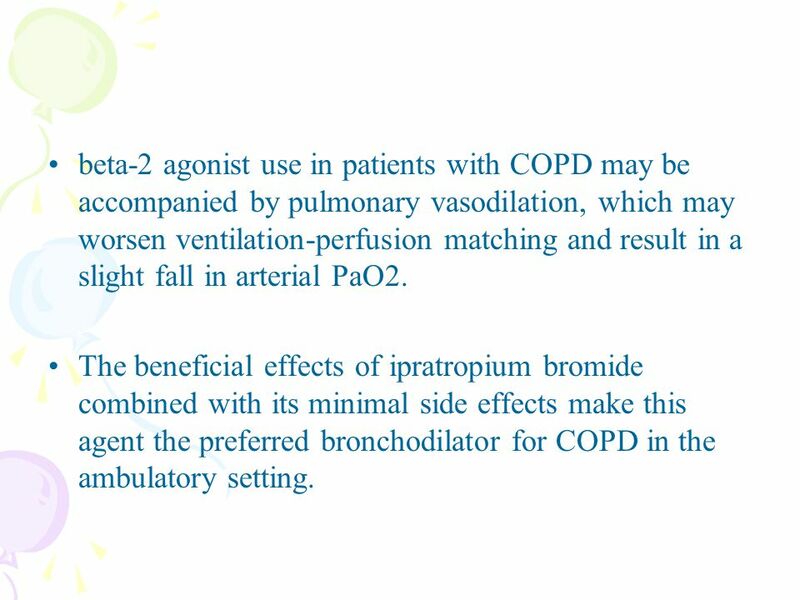 The beneficial effects of ipratropium bromide combined with its minimal side effects make this agent the preferred bronchodilator for COPD in the ambulatory setting. 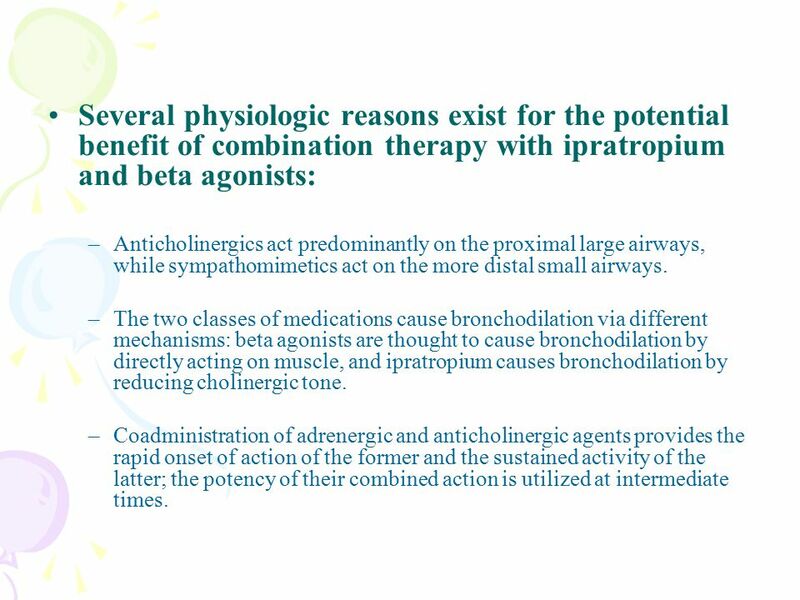 22 Several physiologic reasons exist for the potential benefit of combination therapy with ipratropium and beta agonists: –Anticholinergics act predominantly on the proximal large airways, while sympathomimetics act on the more distal small airways. –The two classes of medications cause bronchodilation via different mechanisms: beta agonists are thought to cause bronchodilation by directly acting on muscle, and ipratropium causes bronchodilation by reducing cholinergic tone. –Coadministration of adrenergic and anticholinergic agents provides the rapid onset of action of the former and the sustained activity of the latter; the potency of their combined action is utilized at intermediate times. 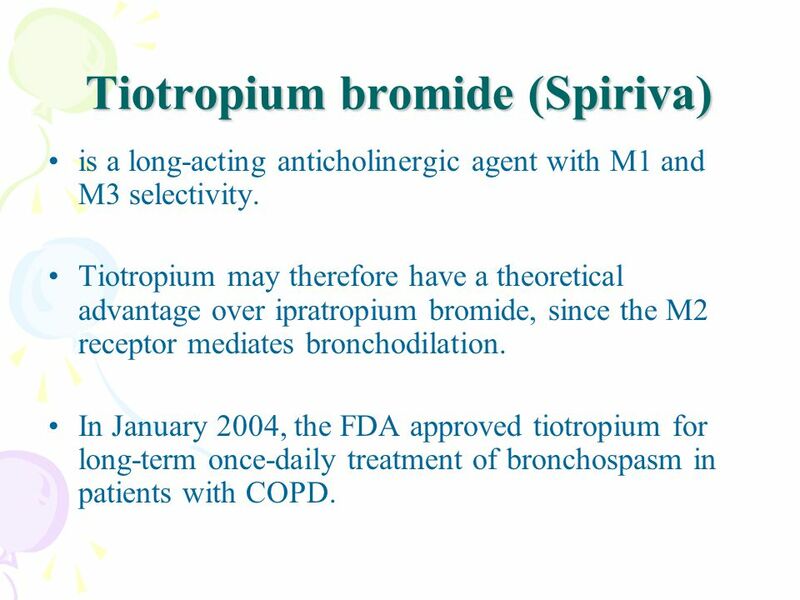 23 Tiotropium bromide (Spiriva) is a long-acting anticholinergic agent with M1 and M3 selectivity. 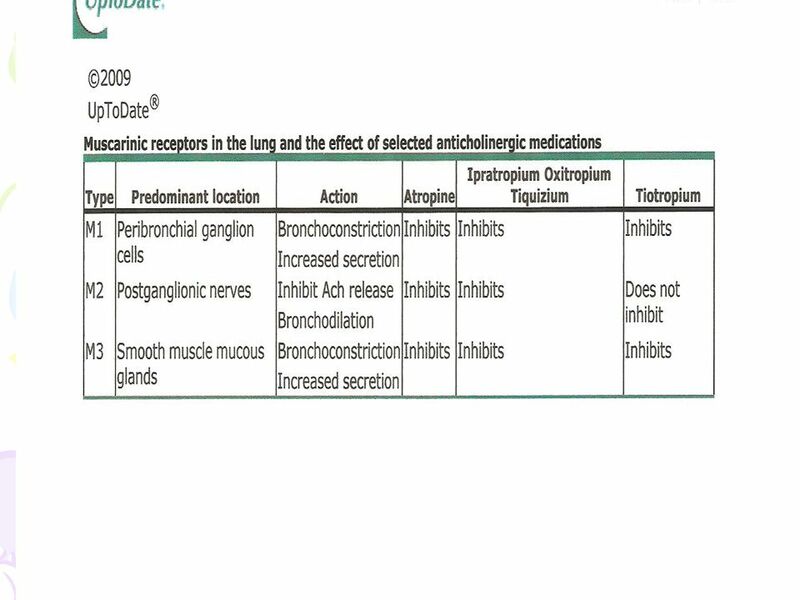 Tiotropium may therefore have a theoretical advantage over ipratropium bromide, since the M2 receptor mediates bronchodilation. In January 2004, the FDA approved tiotropium for long-term once-daily treatment of bronchospasm in patients with COPD. 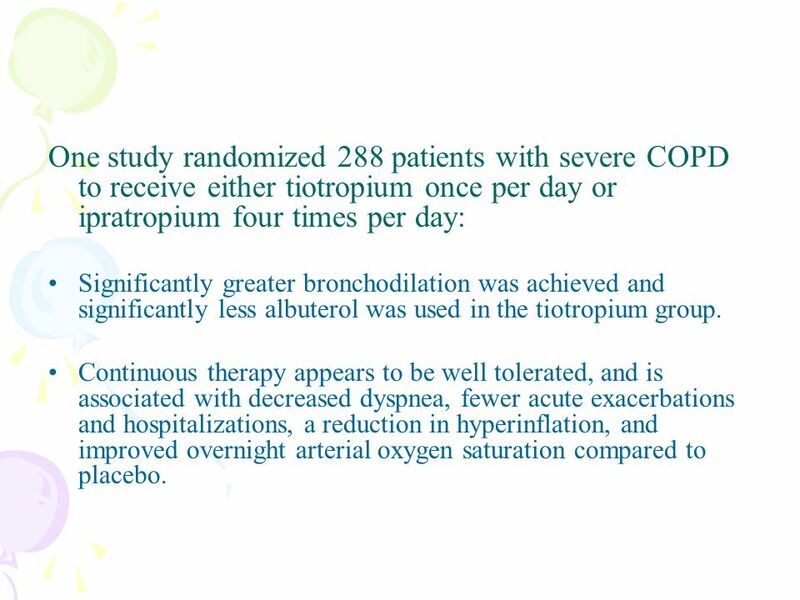 24 One study randomized 288 patients with severe COPD to receive either tiotropium once per day or ipratropium four times per day: Significantly greater bronchodilation was achieved and significantly less albuterol was used in the tiotropium group. 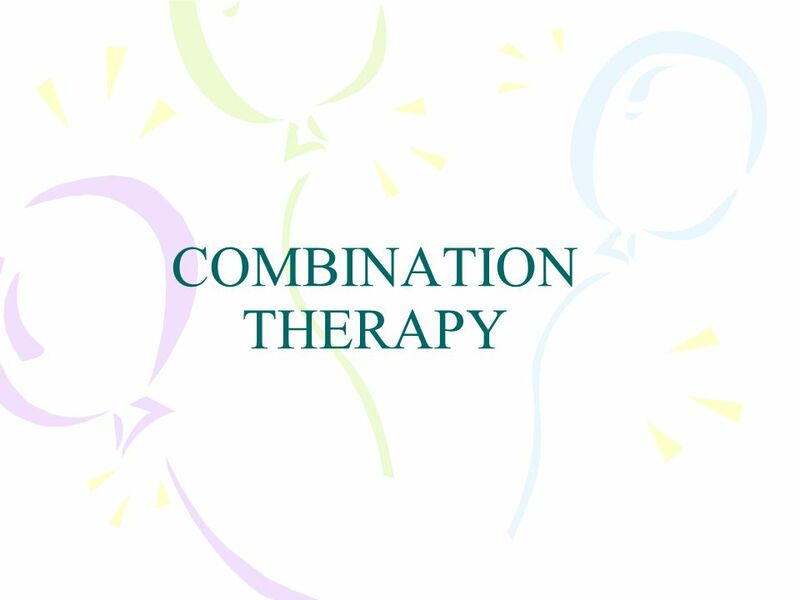 Continuous therapy appears to be well tolerated, and is associated with decreased dyspnea, fewer acute exacerbations and hospitalizations, a reduction in hyperinflation, and improved overnight arterial oxygen saturation compared to placebo. 25 Tiotropium, like ipratropium, appears to provide superior bronchodilation and improvements in dyspnea when compared with long-acting beta-agonists in patients with stable disease. This was demonstrated in a large three-armed study comparing tiotropium with the long-acting beta-agonist salmeterol and placebo in over 1200 patients with COPD. Therapy with tiotropium resulted in a significant delay in the time until first exacerbation, and fewer exacerbations per year, than treatment with salmeterol or placebo. 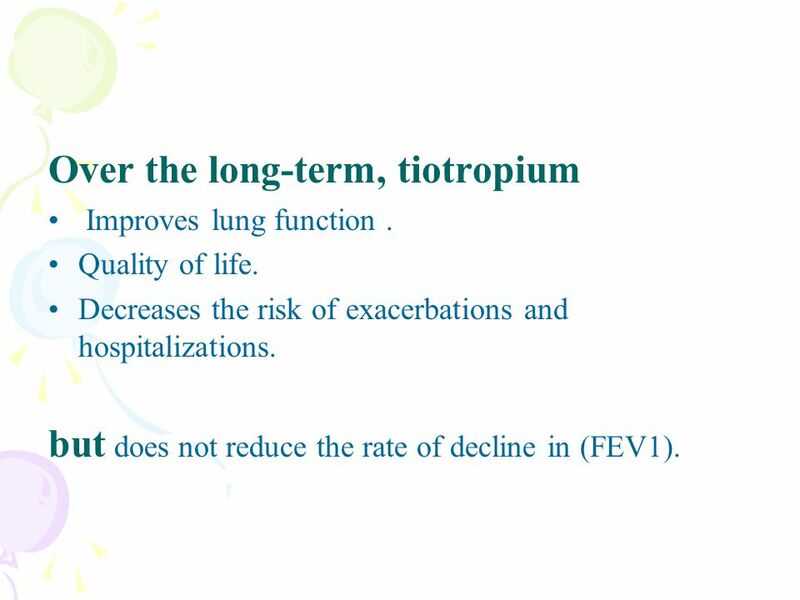 26 Over the long-term, tiotropium Improves lung function. Quality of life. Decreases the risk of exacerbations and hospitalizations. but does not reduce the rate of decline in (FEV1). 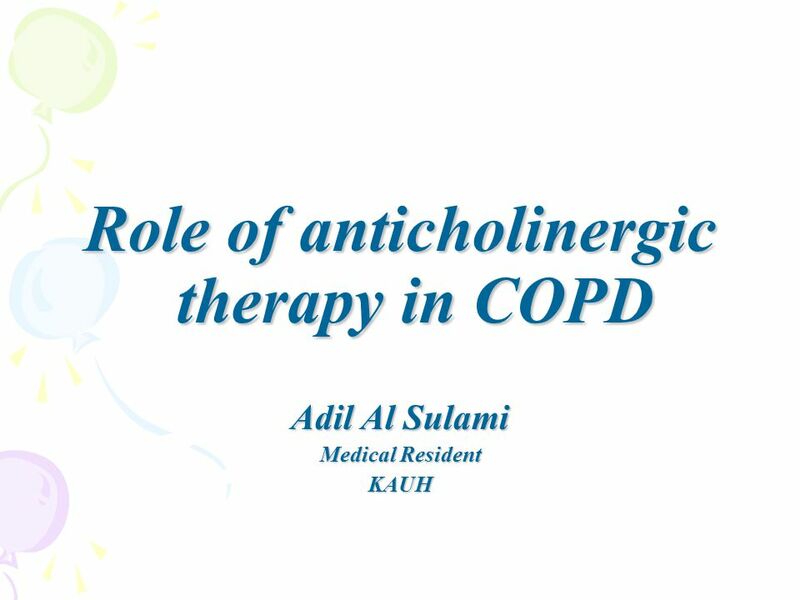 Download ppt "Role of anticholinergic therapy in COPD Adil Al Sulami Medical Resident KAUH." Prof Graeme Henderson Department of Pharmacology C32 Medical Sciences Building Anticholinergics Opioids Benzodiazepines and. UTHSCSA Pediatric Resident Curriculum for the PICU ASTHMA IN THE PICU. 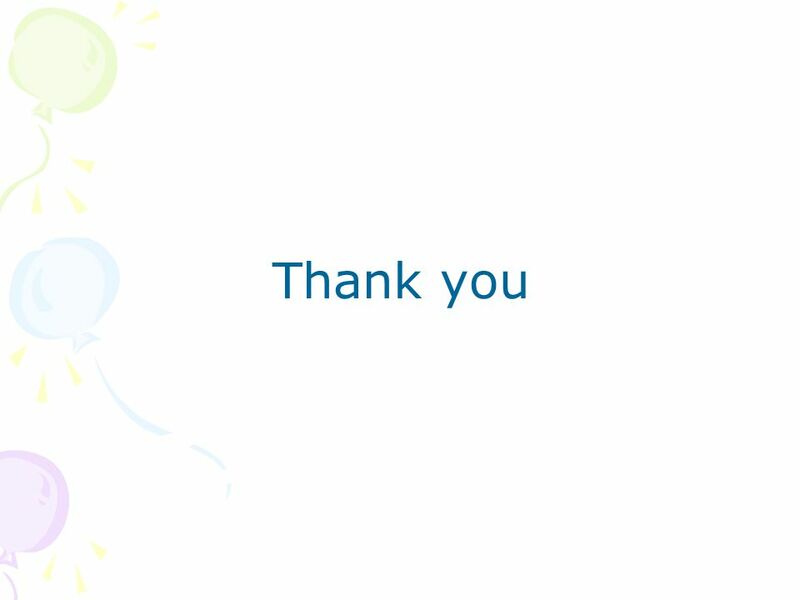 STATUS ASTHMATICUS Sigrid Hahn, MD Andy Jagoda, MD, FACEP Department of Emergency Medicine Mount Sinai School of Medicine New York, New York. Copyright © The McGraw-Hill Companies, Inc. Permission required for reproduction or display. 1 CHAPTER 32 Bronchodilator Drugs and the Treatment of Asthma. Copyright © 2013, 2010 by Saunders, an imprint of Elsevier Inc. Chapter 15 Cholinesterase Inhibitors and Their Use in Myasthenia Gravis. Mosby items and derived items © 2008, 2002 by Mosby, Inc., an affiliate of Elsevier Inc. Chapter 8 Xanthines. The Autonomic Nervous System $100 $200 $300 $400 $500 $100$100$100 $200 $300 $400 $500 Anatomy FINAL ROUND PhysiologyRegulation Function Grab Bag. Respiratory Care Pharmacology  Application of pharmacology to the treatment of cardiopulmonary disease and critical care.  Involves broad area of drug. Pharmacology DOR 101 Abdelkader Ashour, Ph.D. 5 th Lecture. Drugs to Treat Respiratory Disorders. 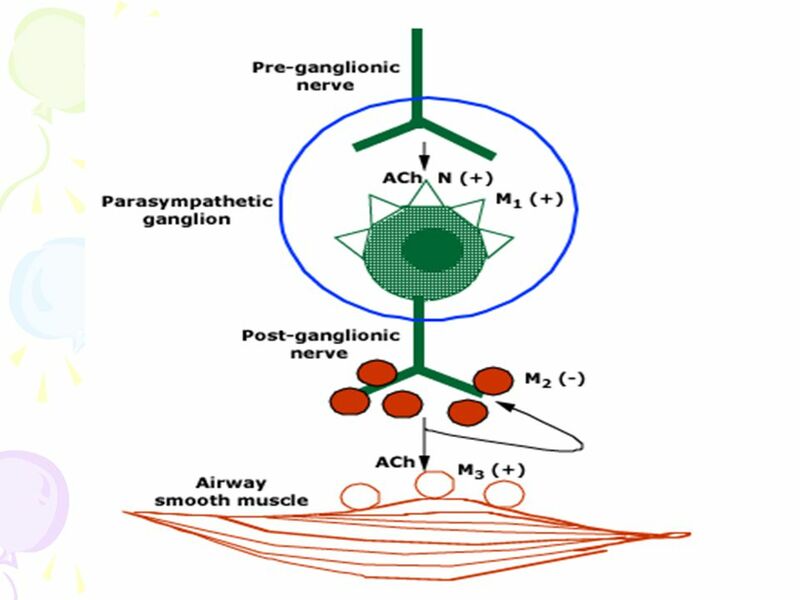 Bronchoconstriction Result from release ACH, histamine and inflammatory mediators Vagus nerve releases ACH ACH triggers. 1. 2 Cholinoceptor-Blocking Drugs Yacoub Irshaid MD, PhD, ABCP Department of Pharmacology. MODULE 3 CHAPTER 2C HYPERTENSION AND COPD.